Writer Sam Humphries’ run on Green Lanterns has done strong work juggling emotional character moments and rousing cosmic action while exploring the larger Green Lantern mythos, and he’s successfully tapped into the full scope of one of DC Comics’ most sprawling concepts. 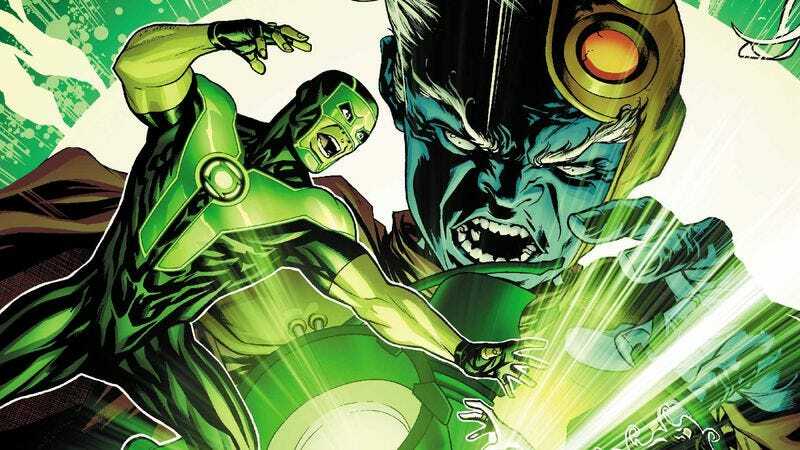 Working with the newest Green Lanterns of Earth, Simon Baz and Jessica Cruz, Humphries has significantly fleshed out the personalities of the rookie superheroes and created a firm bond between the partners. There’s been major growth in their relationship over the course of the book’s first year, and they’ve come to rely on each other for much-needed support when the stress of their job becomes too much to bear. They’re going to need to work together to get out of their current predicament, which has them stranded between dimensions after a climactic showdown with the book’s big bad: Volthoom, The First Lantern. Humphries is devoting a lot of time to the villainous Volthoom, giving him clear motivation for his actions to make him a more engaging antagonist. This exclusive preview of next week’s Green Lanterns #26 continues to explore Volthoom’s history with the Guardians Of The Universe, and it’s specifically building up Volthoom’s past friendship with Rami, the Guardian whose body he possessed in the present. Ronan Cliquet is one of the rotating artists on Green Lanterns, and he’s a sharp storyteller with a clean art style. He captures Volthoom’s madness in the opening splash page showing him brandishing The First Ring, and colorist Ulises Arreola heightens that instability with an explosion of colors from all across the spectrum. Arreola is a new addition to this book’s creative team, and he’s proven to be a very good fit with his smooth rendering and penchant for bright palettes. He understands that superhero comics are the place to go wild with colors, and Arreola’s bold work energizes the artwork.